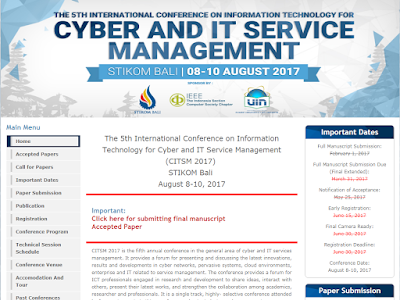 CITSM 2017 is the fifth annual conference in the general area of cyber and IT services management. It provides a forum for presenting and discussing the latest innovations, results and developments in cyber networks, pervasive systems, cloud environments, enterprise and IT related to service management. The conference provides a forum for ICT professionals engaged in research and development to share ideas, interact with others, present their latest works, and strengthen the collaboration among academics, researcher and professionals. It is a single track, highly- selective conference attended by foremost experts in this area from academia, industry and government. 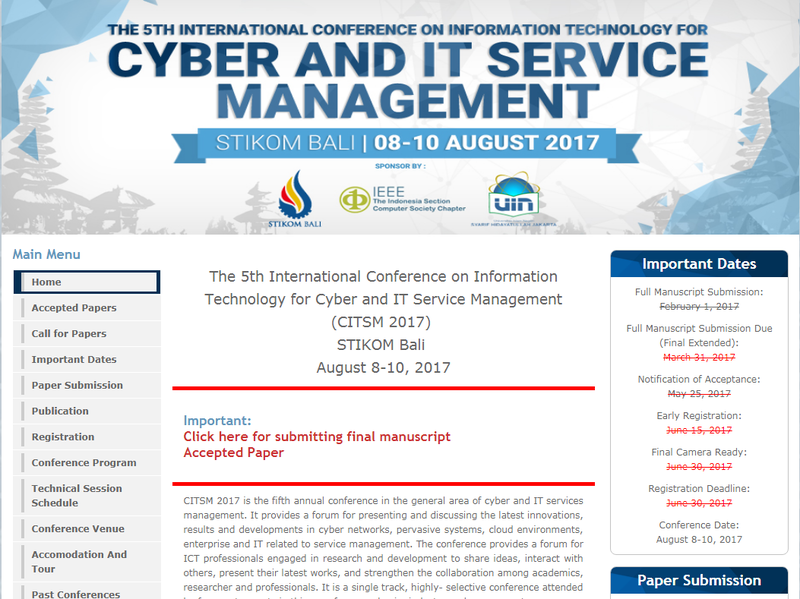 Last conference (CITSM 2016) proceeding has been published on IEEE Xplore and Indexed by Scopus). This year, all accepted papers that presented in this conference will be submitted to IEEE Xplore and selected papers are published at one of the following 4 international journals (Scopus indexed) :International Journal of Web Information Systems (IJWIS), Journal of Mobile Multimedia (JMM), International Journal of Mobile Computing and Multimedia (IJMCMC) and IJPCC with some revisions. Abstract- This paper proposed a hybrid method that had been solved both of these issues. 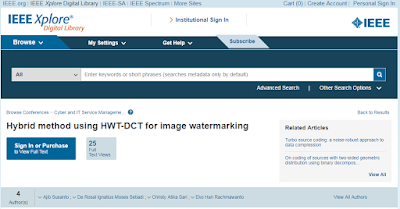 We proposed a combination of Discrete Cosine Transform (DCT) and Haar Wavelet Transform (HWT) due to achieved imperceptibility and robustness comes from PSNR and NC value. Firstly, HWT applied in host image and then selected subband LL. LL subband will be divided into an 8x8 matrix in which each matrix was applied using DCT. Copyright embedded at the DC coefficient. In this paper we choose PSNR to measure the imperceptibility. Meanwhile, to measure the extracted copyright we used correlation coefficient. The results of this simulation method getting high PSNR value with an average of 43.2392 dB. Experiment results of extraction has tested using image watermarking attacks are JPEG compression, low pass filtering, mid filtering, unsharp filter, gaussian noise, cropingp, blurring, salt and pepper with the average value of the correlation coefficient of 0.8676. Our results proved that HWT-DCT has fulfilled the purpose of image watermarking, namely copyright protection.